Since it first opened in 1914, the Panama Canal has provided the primary shipping conduit linking the Pacific and Atlantic Oceans through the Americas. And in that time, it has also represented U.S. dominance in the region. Even after the canal passed entirely into Panama's control in 1999, the United States has maintained a strong military presence in the region, establishing its continuity as the region's key economic and political player. Nicaragua and China have come to an agreement allowing the construction of a new inter-oceanic canal in Nicaragua, connecting China with the Caribbean and its Atlantic-American trade partners. This won't just increase the flow of goods between China and the Americas. It will also usher China into the region as a major political force—something that is likely to raise alarm in Washington, which will regard any Nicaragua-China alliance as a destabilizing influence in the hemisphere. China's role in the development of this canal is partly about expanding its global trade. But it's also a way for China to push back against Washington's militarized "Pacific Pivot," as well as the U.S. drive to establish a Trans-Pacific Strategic Economic Partnership (commonly shortened to Trans-Pacific Partnership, or TPP) that seeks to contain China's global economic growth. The TPP is a U.S.-led free trade agreement—a partial draft version of which WikiLeaks recently exposed to the public—that is being devised in secret by 12 Pacific Rim governments and 600 of the world's largest corporations. It seeks to define the rules for investment and trade in the 21st century. Unless China is willing to adopt rules that will rewrite its regulatory and investment laws to conform to the standard of this agreement—for example, by curtailing its state-owned investments and opening its state-owned enterprises to Wall Street investment rules—China will remain outside the TPP. This is not to say that China needs to submit to this bullying. For example, China has capitalized its own development fund with the BRICS (Brazil, Russia, India, China, and South Africa) association, and organized its own economic partnership with ASEAN member countries in Southeast Asia (many of which are also involved with TPP negotiations) under the auspices of the Regional Economic Comprehensive Partnership (RCEP). China's FDI strategies have surpassed analysts' expectations, and last year China became the third largest investor country, behind the United States and Japan. According to a recent press release by the United Nations Conference on Trade and Development, China's tremendous investment in many African countries has driven up FDI in Africa, defying the global trend. In Nigeria alone, China's investment rose from $75 million to $1.2 billion between 2004 and 2010. The United States, while still a much larger investor, has been unable to match the growth of China's investment in resource-rich developing countries. Due to its increased shipping of resources and goods, China has emerged as the new center not only for global manufacturing but for investment as well. To put this in perspective, China's container traffic measures over 5,000 transits a year, with hauls exceeding 10,000 gross tonnage per ship. According to a World Bank Data chart, China's container traffic surpasses that of the United States by a ratio of nearly three to one. The TPP—with its current 12-nation membership, including Australia, Brunei, Canada, Chile, Japan, Malaysia, Mexico, New Zealand, Peru, Singapore, the United States, and Vietnam—has a combined GDP of more than $27 trillion, representing over a third of global GDP. Yet despite its economic power and its military influence throughout the region, the United States has not been able to conclude this agreement. There has been focused criticism nationally and internationally against the TPP, as it is seen as an undemocratic agreement primarily written by corporations for the benefit of corporations. Additionally, for the TPP to conclude, it still needs congressional approval. The push to "fast-track" Obama's Trade Promotion Authority is likely to meet further resistance from lawmakers. China's success in regional and global trade, meanwhile, has given it the economic and fraternal clout to partner with the other ex-colonial—or ex-socialist—emerging economies to provide an alternative model to the neoliberal TPP. It is therefore no coincidence that none of the BRICS countries participates in the TPP. What BRICS offers is a new reserve currency that helps stabilize economies in developing markets, thereby providing greater access for development and trade, as well as a less draconian debt structure, compared to Wall Street investments. Of course these competing systems are not mutually exclusive—after all, China and the United States have a symbiotic and integrated economic relationship with each other. However, the TPP and the BRICS economies are competing over the trade and investment rules for the 21st century—and the neoliberal model no longer gets the last word. The proposed Nicaraguan canal is a tangible symbol of this emerging multipolarity. The canal would bypass not only the already congested Panama Canal, but also the strong U.S. military presence patrolling the area. The access provided by Nicaragua's canal would be a welcome and long-sought opportunity for Global South economies—especially for regional economic and political trading blocs like the South American Common Market called Mercosur, and the Bolivarian Alliance for the Americas (ALBA). As we unpeel the geographical layer of the TPP, we find that the TPP countries form an integrated wall separating the Mercosur and ALBA economies under Brazil's economic influence from the Asia-Pacific economies under China's regional influence—in effect turning the west coast of South America into a barrier between two of the BRICS charter members. 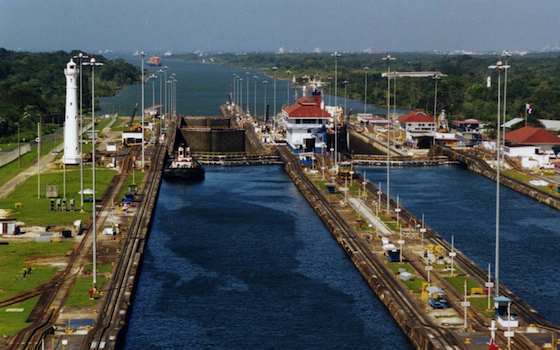 A Nicaraguan canal not only provides the maritime access that streamlines the supply chain between China and Brazil, but it also provides new trade advantages to the Global South. This does not necessarily alienate the United States, but it does have the potential impact of reducing U.S. economic and military hegemony in the region. In a 2008 hearing before the House Committee on Foreign Affairs on "The New Challenge: China in the Western Hemisphere," U.S. representatives expressed concerns that Latin American countries were beginning to turn away from U.S. investment in favor of China. Latin America expert Daniel Erikson testified that "the pace of trade between China and the region has skyrocketed from $10 billion in 2000 to over $100 billion in 2007." In 2012, China surpassed $200 billion in trade, doubling the 2007 figure, and supplanted the EU as Latin America's second-largest trading partner after the United States. The Nicaragua canal would be yet another blow to U.S. influence in the region. Although the United States relinquished its official sovereignty over the Panama Canal in 1999, it continues to have a strong military presence in the region, maintains first rights for the passage of military ships, and cooperates with Panama to patrol and check ships without warrant. At this time, the United States does not have such an agreement with Nicaragua. Both the TPP and the U.S. "Pacific Pivot" have been framed as a kind of "China containment strategy." This is not to say that the United States is practicing the same kind of containment strategy it has towards North Korea. For one thing, as long as China's trading partnerships remain productive, any suggestion of containing China would likely be seen as a deluded conceit. Perhaps a better description is that the United States is practicing a "containerment" strategy with China—a policy that seeks to assert greater control over China's overseas investment by controlling the shipping lanes that move the bulk of resources and manufactured goods to and from China. If China gets a new route to the Atlantic, this strategy may wither on the vine. A China-led Nicaragua Canal challenges Washington's 150-year-old claim of military and economic hegemony in the Western Hemisphere as outlined in the Monroe Doctrine. The rise of the trans-global BRICS economy, coupled with a new inter-oceanic canal that the United States has no jurisdiction over, means that the United States has been, at this moment, out-maneuvered by China. Whether Washington attempts to reassert its hemispheric dominance remains to be seen. It will certainly be a challenge, since blowback from the United States' historically brutal policies in Latin America could very well strengthen economic ties among the developing economies represented by China and their BRICS partners. Although the completion of a Nicaragua Canal will likely be fraught with difficulties, this China-Nicaragua partnership demonstrates that China will not be container-ed. Foreign Policy In Focus contributor Arnie Saiki is the coordinator for Moana Nui Action Alliance, which focuses on Pacific Island political and economic justice issues.